Cutting a whole chicken is easier than you think! Learn how to cut a whole chicken and debone a chicken! You will save money and have a carcass left over for the most incredible chicken bone broth! Pat dry chicken with paper towel. Place chicken breast-side-up and first remove the whole legs (drumsticks with thighs attached). Make a slit just behind the drumstick separating the drumstick and the breast, just cutting through the skin to expose the meat underneath. Pull leg away from the chicken and pop hip bone out of it's socket just below the breast. Cut with a knife just past the joint, getting as much meat as possible including small meaty "oyster" section next to the tail. To separate drum from thigh, cut along the fat line and you should cut right between the joints - if you feel resistance, shift your knife around until it slides through fairly easily. Place breast side up with wings away from you. To remove the wings: feel for the joint then cut through the skin and through the joint (not the bone) - shift knife around slightly if you get resistance until it goes through easily. 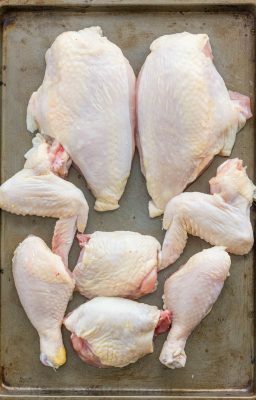 Pull wing up away from chicken for greater control while cutting. To remove the chicken breast: Turn chicken on it's side and cut along fat line on the side of chicken carcass with kitchen shears, snipping right through the ribcage. To debone chicken breast, cut through center of the skin over the chicken breast - locate the breastbone and cut the chicken away from the bone with long strokes (not a sawing motion) and cut all the way down which should completely debone the chicken breast.